If you love the ocean and everything that goes with it, please lend a hand in doing your part to protect the environment! Take 60 seconds to sign the petition against Rehoboth Beach, Delaware's plan to dump "effluent", aka treated waste water from its city's sewage treatment plant, into the Atlantic Ocean! Rehoboth is a beach town located in southern Delaware about 15 miles north of the Maryland/Delaware border. In the summer, its population swells as a beach vacation destination. I grew up heading to Rehoboth for its boardwalk's rides, Grotto Pizza and the horse-race game. Unfortunately, Rehoboth is proposing one pollution problem to solve another. Currently, Rehoboth is discharging its sewage wastewater into the Lewes-Rehoboth Canal, which flows into the Rehoboth Bay and the Indian River Bay. Not surprisingly, the water in those bays is suffering from excess algae growth, which is highly detrimental to water quality. 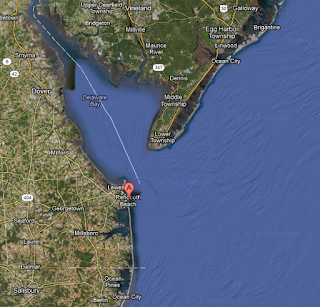 So Rehoboth has to find another place to dump its wastewater. Since the bays didn't work out as a dumping spot, it's new solution is the Atlantic Ocean. that all water quality criteria and public health standards are achieved." It's funny how harmless they can make it sound. Why the ocean? It's "the most practical solution." Perfect.  Pharmaceuticals and Personal Care Products (PPCPs)"
What can you do to help out? Surfrider Delaware is doing its best to promote this issue to the public. 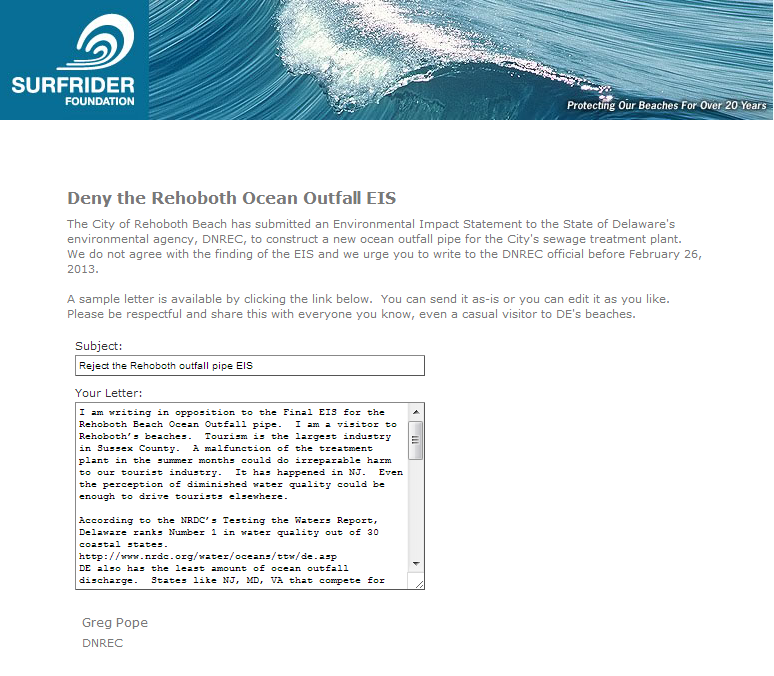 It's offering a easy link to submit your opposition to the Rehoboth Outfall Pipe - sign your name and email and your comment goes to the Director of the Delaware Department of Natural Resources and Environmental Control. Please sign the petition now - the comment period closes February 26. And help keep wildlife - plants, animals and humans alike - from swimming with metals and personal care products!